At issue is whether Mallinckrodt LLC, which inherited the pollution problem, must expand its cleanup. AUGUSTA – Nearly 15 years after the closure of a chemical plant that dumped mercury into Maine’s Penobscot River, a federal trial began Tuesday to determine whether the company now responsible for it must pay to clean up the downriver contamination that advocates say puts humans and wildlife at risk. 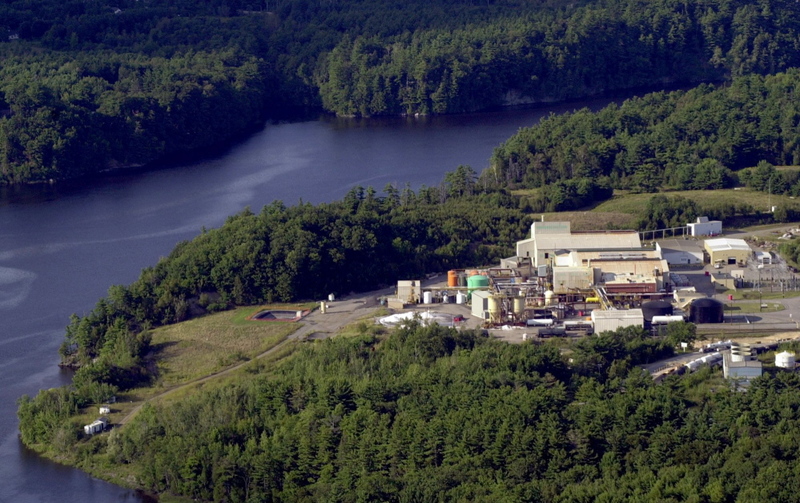 The Maine People’s Alliance and Natural Resources Defense Council say Mallinckrodt LLC should be forced to clean up the mercury released by the now-defunct Orrington plant in the 1960s and ’70s. The groups contend that unless treated, the pollution will remain in riverbank sediment for decades. 2000 Associated Press File Photo HoltraChem Manufacturing Co. of Orrington dumped mercury into the Penobscot River in the 1960s and ’70s. “At stake in this historic trial is the citizens’ right to hold corporations – no matter how rich or powerful – fully accountable for the damage they inflict on our environment and public health,” Jesse Graham, executive director of the MPA said in a statement Tuesday. Mallinckrodt inherited responsibility for the site when the HoltraChem Manufacturing Co. plant went out of business in 2000. The Maine Supreme Court ruled in April that the company must complete the estimated $130 million cleanup of former plant’s site. The trial in the U.S. District Court in Bangor, which is expected to last several weeks, will decide whether the company should also clean up the pollution downriver to the upper Penobscot Bay. The arguments will focus on a scientific study completed last year that recommends several treatment options be undertaken due to the river’s slow rate of recovery and the continued risk to organisms and human consumers. Last month, the state indefinitely closed a seven-square-mile area of the lower Penobscot River to lobster and crab fishing due to the levels of mercury contamination. Lawyers for Mallinckrodt argued in pre-trial court filings that the river is less contaminated than the study suggests. The company says the river is in the process of cleaning itself and that some of the proposed treatment plans could have unintended consequences. Mallinckrodt, a unit of medical device manufacturer and supplier Covidien, instead wants to monitor the river’s recovery and conduct a study focused on marsh birds, which it contends is the only species that may be significantly affected by the mercury. “Mallinckrodt does not believe large-scale remediation is necessary; however, the company has developed a proposal for certain limited studies and a proposal for monitoring some wildlife species, including but not limited to, certain fish and birds,” said Lisa Clemence, a Covidien spokeswoman said in an email. But the Maine People’s Alliance and Natural Resources Defense Council says that the company is trying to duck its responsibility and that the scientific study proved that more needs to be done to protect the wildlife in the river and people who live along its banks.